An alleged image showing the OnePlus 6T battery has surfaced on Weibo, revealing a 3700mAh typical capacity. Yesterday, we brought to you the first 5K renders of the upcoming OnePlus 6T, revealing some of the key design features of the smartphone. The renders confirmed that the next OnePlus flagship handset will have a tiny waterdrop notch at the top and lack a 3.5mm headphone jack. While the design of the OnePlus 6T has been fully revealed now, some of its hardware specifications still remain a mystery. As we mentioned in our report, the OnePlus 6T will be thicker than the OnePlus 6, which suggests that it might pack a larger battery. A purported image of the smartphone’s battery has now leaked online, revealing a decent increase in capacity. 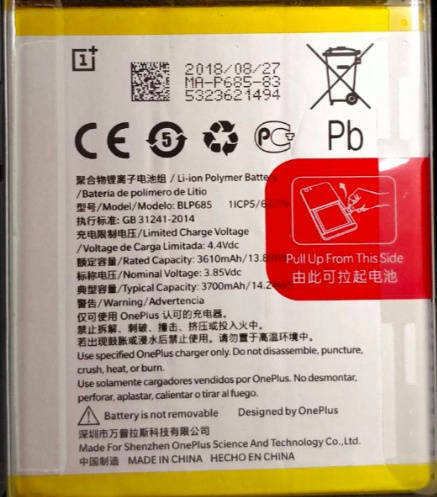 The leaked image reveals the OnePlus 6T battery bears the model number BLP68S and has a typical capacity of 3700mAh. Its rated capacity, on the other hand, is 3610mAh. Interestingly, the OPPO R17 Pro also features an identical-sized battery. It was recently rumored that the OnePlus 6T will be based on the OPPO R17 Pro, so this is certainly not surprising. The current OnePlus 6 has a 3300mAh capacity battery but it still manages to provide impressive battery life. Thanks to the larger battery, we expect the OnePlus 6T to be even better in terms of battery life. 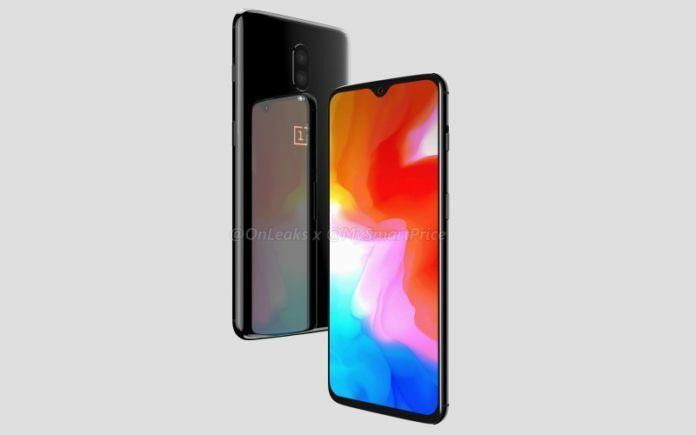 The OnePlus 6T is expected to arrive with a 6.4-inch Optic AMOLED display featuring 1080 x 2340 Full HD+ resolution and a 19.5:9 aspect ratio. Not only will the OnePlus 6T sport a bigger display compared to the OnePlus 6, it will also come equipped with an in-display fingerprint sensor. The upcoming flagship smartphone will be powered by an octa-core Qualcomm Snapdragon 845 chipset under the hood, coupled with up to 8GB of RAM and 256GB of internal storage. The camera hardware still remains a mystery, although we don’t expect to see any major upgrade in the camera department compared to the current OnePlus 6. Connectivity features will include Wi-Fi 802.11 a/b/g/n/ac dual-band, Bluetooth 5.0 Low Energy, GPS with A-GPS, GLONASS, BeiDou, Galileo, NFC, Dual 4G VoLTE, and a USB Type-C port. In terms of software, we expect the OnePlus 6T to ship with Android 9.0 Pie-based OxygenOS out of the box. The smartphone is expected to be launched in India on October 17. Just like previous OnePlus flagships, the OnePlus 6T will be launched as an Amazon-exclusive in the country.